Coach one dumps the puck behind the net. Player one chases the puck. 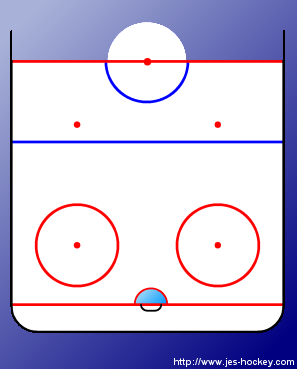 As player 1 passes player 2's position, player 2 starts to time his skate toward center ice. Coach 2 makes a pass to player 2 in the neutral zone who is heading toward center ice. As coach 2 passes the puck to player 2, player 3 starts to move around behind player 2. Player 2 will drop the puck for player 3. Without going offside, players 1 & 2 start to enter the offensive zone; therefore player 1 begins to skate backwards to go 2 on 1. 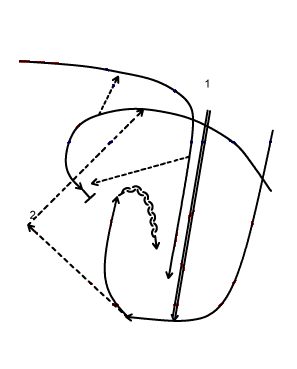 Player 2 starts to slow and time his skate to receive a pass before the top of the circle. Player 3 will pass the puck to player 2 before player 2 hits the top of the circle. Player 3 will now drive hard to the net awaiting a rebound. Player 2 will release a shot shortly after the top of the circle.